We love Nicolas Cage! He has embraced his role as Genre Movie King by appearing in a series of wild, sometimes shocking, and usually entertaining films. I'm thinking especially of Mandy (pictured) and Mom and Dad, but I really liked Looking Glass, too, and we all have our favorites. "Every six years, an ancient order of expert Jiu Jitsu fighters faces a fearsome alien invader in a battle for Earth. For thousands of years, the fighters that protect Earth have played by the rules...until now. "When Jake Barnes (Alain Moussi), a celebrated war hero and master Jiu Jitsu fighter, refuses to face Brax, the indomitable leader of the invaders, the future of humanity hangs in the balance. Injured and suffering from severe amnesia, Jake is captured by a military squad unequipped to fight the merciless intruder who have descended upon the planet. 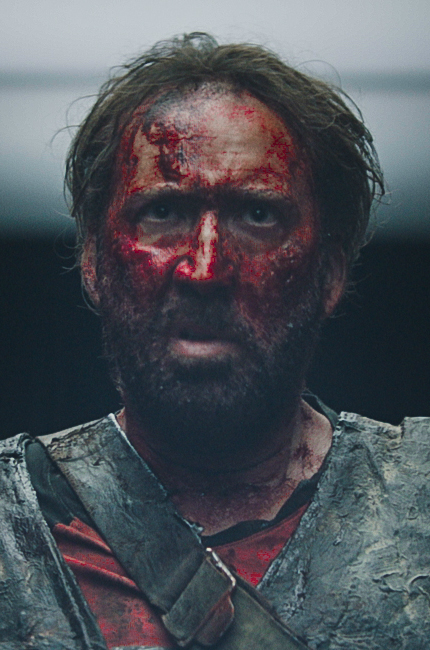 "After a brutal alien attack on the military squad, Jake is rescued by Wylie (Nicolas Cage), and a team of fellow Jiu Jitsu fighters who must help him recover his memory and regain his strength in order to band together and defeat Brax in an epic battle that will once again determine the fate of mankind." Jiu Jitsu is currently on offer at Hong Kong Filmart 2019. Highland Film Group is handling worldwide sales. We look forward to Nicolas Cage on the big screen, leading a team of fighters on a rescue mission that only involves the future ... of everybody on Earth!